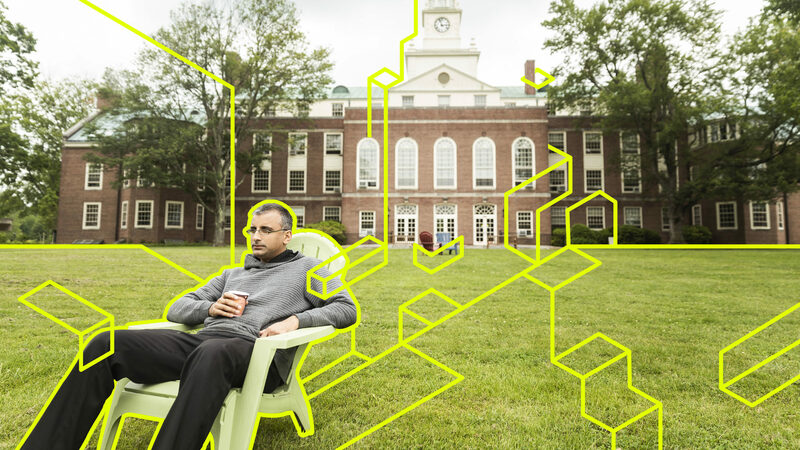 Akshay Venkatesh on the south lawn of the Institute for Advanced Study in Princeton, New Jersey. Venkatesh’s other daughter, 7, wandered somewhere with her friends on the serene grounds of the institute’s visitor housing complex, which lends itself to the kind of free-range childhood that has become rare these days. Venkatesh had been visiting IAS for the past year, on leave from Stanford University; as of mid-August he will join the institute’s permanent faculty, whose previous members include Albert Einstein, Kurt Gödel and quite a few winners of the Fields Medal, the highest honor in mathematics. His ideas are “a vast expansion of the imagination,” said Michael Harris, a mathematician at Columbia University. Mathematics research, with its winding paths and dead ends, was very different from the kind of math Venkatesh had excelled at in school, with its problem sets and clearly defined endpoints. Accustomed to meeting the highest of standards, he saw his dissertation as mediocre. Quietly, Venkatesh started eyeing the exit ramps, even taking a job at his uncle’s machine learning startup one summer to make sure he had a fallback option. Now 36, Venkatesh carries himself with the ease of someone who is thoroughly comfortable with his life choices. But it has taken him many years to see what other mathematicians have long seen in him. “It took me a long time to really feel satisfied with what I was doing,” he said. Venkatesh said he works best in his office at the Institute for Advanced Study. Most mathematicians struggle to describe the full range of Venkatesh’s diverse mathematical contributions, which build bridges from number theory to distant fields such as algebraic topology and dynamical systems. He is known for moving into an area of mathematics, transforming it, and then moving on. Mathematics is a comparatively straightforward subject in which to accelerate, since it doesn’t require vast amounts of life experience. After Venkatesh completed a math degree (with first-class honors) at the University of Western Australia in Perth at age 16, he rode his momentum to graduate school without really considering other alternatives. But he sees nothing foreordained in his choice. “I also would have been happy doing something else,” he said. When he felt discouraged, Venkatesh would dive into some mathematics textbook, often on a topic far removed from his research. “I think that’s what has always kept me going, even when my own research hasn’t gone anywhere — I’ll read something and I’ll think, ‘Well, this is really wonderful,’” he said. Venkatesh absorbed voluminous amounts of mathematics during his graduate years. It wasn’t intended as a strategic move, but it gave him the big-picture view that now allows him to discover connections other mathematicians have missed. 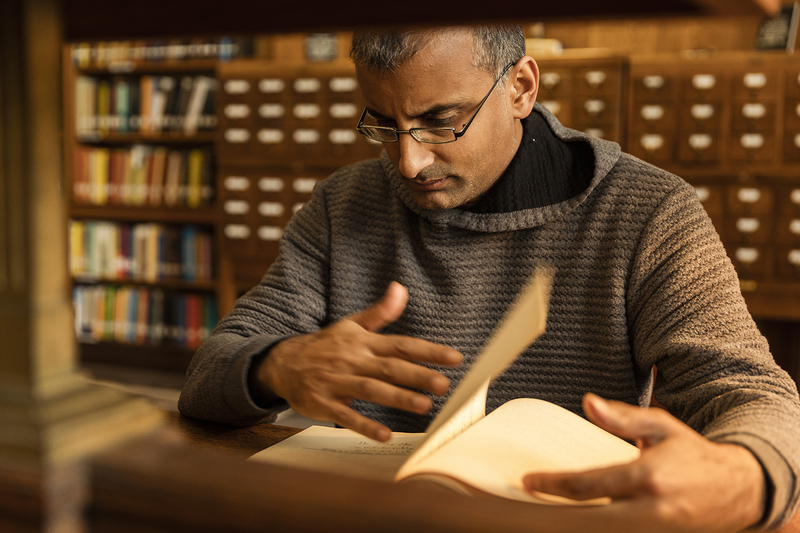 Venkatesh at the mathematics and natural sciences library at the Institute for Advanced Study. Emerging from graduate school in 2002 without having yet achieved this self-awareness, Venkatesh was eager to prove himself. A collaboration with Ellenberg soon gave him the opportunity. The pair took on the task of counting “number field extensions,” the simplest of which are built by adding to the rational numbers a handful of irrational numbers that satisfy some polynomial equation. These number systems “have a little bit of irrationality, but not too much,” said Ellenberg, who is now a professor at the University of Wisconsin, Madison. There are infinitely many number field extensions, but there’s a natural way to measure how complex each one is, and the question then becomes to count how many there are below each complexity level. Venkatesh and Ellenberg figured out a new upper bound on these counts that greatly improved on the previous state of the art, which hadn’t budged for decades. The pair originally tackled the problem using some new mathematical tools they’d heard about at a conference. 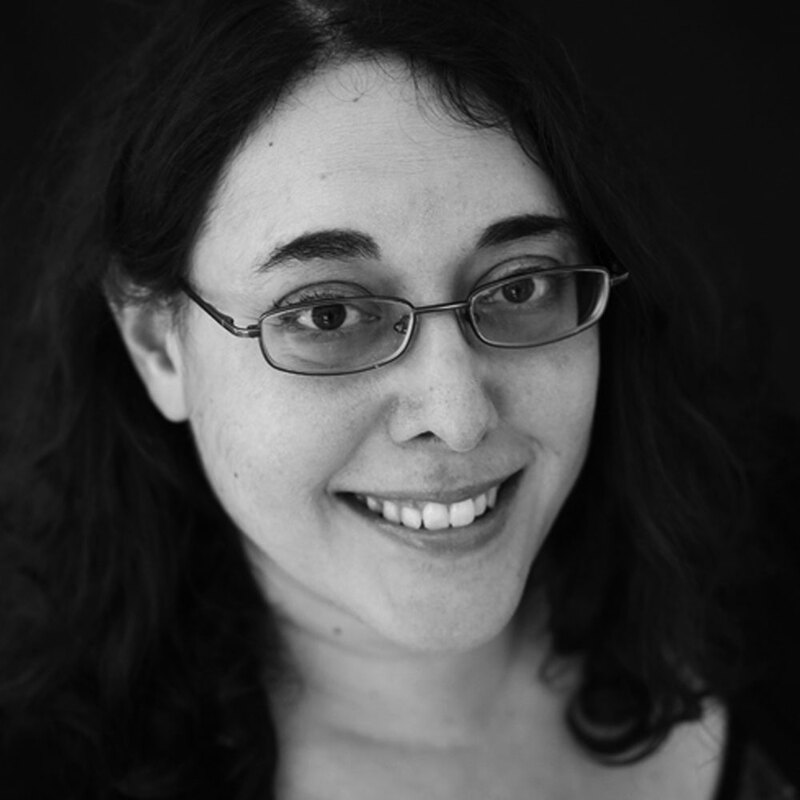 But as they worked to improve the exposition of their proof, they eventually found that they had simplified away all the sophisticated new tools, Ellenberg said. Many mathematicians besides Ellenberg are struck by Venkatesh’s ability to distill ideas down to their essence. “When he’s finished, often his proof is the proof that would be in any textbook from here on,” Sarnak said. Soon after his work on number field extensions, Venkatesh carried out a new study that Sarnak calls his first “home run.” It concerned generalizations of the Riemann zeta function, which maps each number s to the infinite sum 1/1s + 1/2s + 1/3s + 1/4s + …. In 1859, Bernhard Riemann showed that knowing which values of s make this function spit out the number zero would tell mathematicians how many prime numbers there are that are smaller than any given number. But no one has succeeded in proving his hypothesis about where these “zeros” lie. The Riemann hypothesis, which has hundreds of consequences beyond explicating the distribution of prime numbers, is widely regarded as the most important unsolved problem in mathematics. Since the mid-19th century, mathematicians have considered variants of the zeta function in which the ones in the numerators of the infinite sum are replaced by a more complicated sequence of numbers, generally a mix of positive and negative terms. Each of these “L-functions” has its own version of the Riemann hypothesis, which, if proved, would unlock other prime number mysteries, such as how prime numbers are distributed within various sequences of numbers. These generalized Riemann hypotheses are also extremely hard to prove, so for decades, mathematicians have looked for ways to sidestep the hypotheses and prove some of their many consequences directly. One of the most important of these consequences is something called subconvexity, which says, roughly speaking, that the positive and negative numbers in the sequence of numerators of an L-function quickly start balancing each other out. Subconvexity estimates for L-functions, when they can be proved, yield statistical information about patterns in whole numbers — for example, one subconvexity estimate gives a description of the variety of ways any given large number can be written as the sum of three perfect squares. Venkatesh and Michel teamed up on a second paper that used this new approach to find subconvexity estimates for a huge family of L-functions. The pair of papers, along with several others Venkatesh wrote around that time, Sarnak said, “made him already one of the leading people in the world” in number theory and dynamics. We strolled from his office to the institute’s preschool to pick up his younger daughter, Tuli, and then to their apartment in the visitor housing complex. Tara arrived soon after on the school bus, and Venkatesh settled in on the sofa, tickling Tuli while Tara eagerly described a science expo at her school. Venkatesh was on solo parent duty, since his wife, Sarah Paden, who is finishing up her doctoral dissertation in musicology at Princeton, was away at a college reunion. It’s a role he slips into easily when she needs to travel, Paden said: He follows a comfortable groove that runs through the library, the coffee shop and home. Venkatesh is still an avid reader, although these days his book selection process usually involves simply snatching whatever looks interesting off the library shelf before his daughters drag him to the children’s section. At the moment, he’s rereading War and Peace. The writing is as wonderful as he remembers from his previous time through, but “it has these didactic passages that I find more annoying now than when I was younger,” he said. 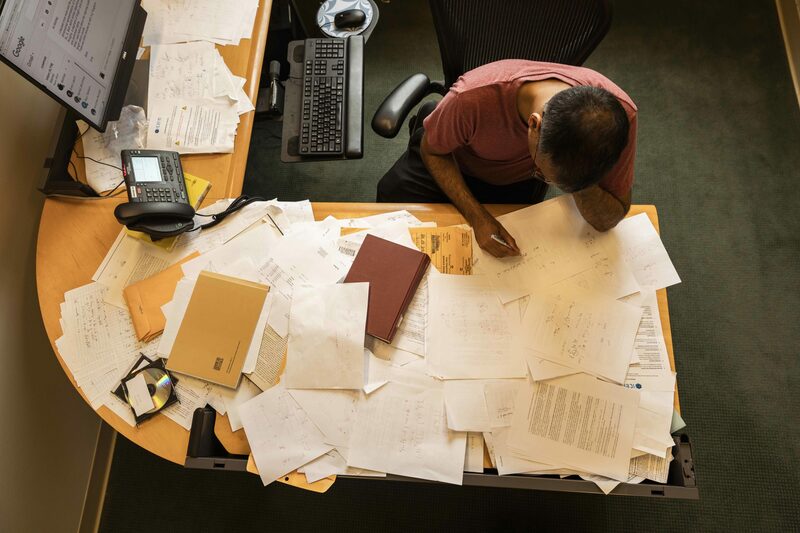 Video: Akshay Venkatesh on his mathematical working style, which took him many years to discover. The simplicity of life at IAS, with its on-site housing and child care, makes it a congenial environment for Venkatesh. There’s coffee — one of his small joys in life — down the hall from his office and in the cafeteria, though there too he has established a routine to make sure he doesn’t overindulge: one coffee at home over breakfast, one midmorning at the institute, and one after lunch. His office has the rare luxury of a second blackboard, which he has tiled with small boxes, iPhone style, containing reminders ranging from “Brazil visa” and “Chapter 13” to mathematical formulas. 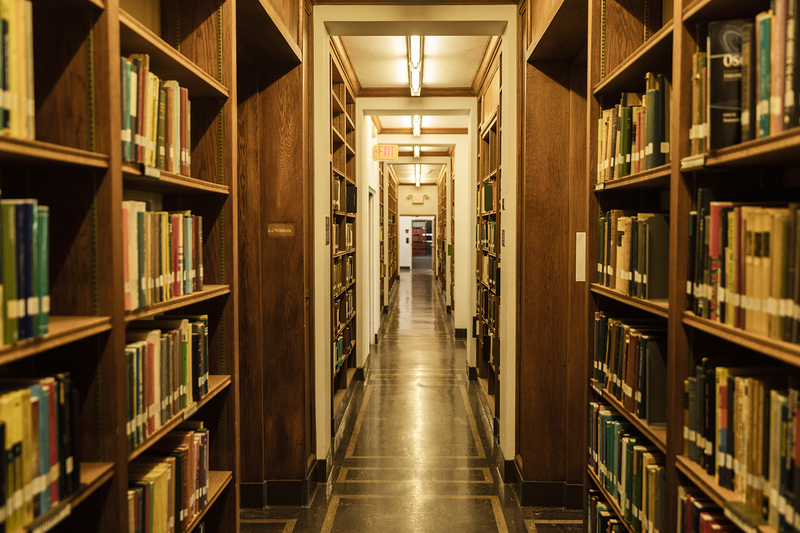 And life at the institute provides the two elements most essential for Venkatesh’s research: large blocks of unbroken time, and an office big enough for him to pace around in while he thinks. Back at Stanford, a patio outside the math department filled a similar function. He was especially surprised to win the Fields Medal because much of his recent work has been highly conjectural, and the medal often goes instead to people who have solved some big well-known problem. “My work is not of that nature, nor did I attempt for it to be of that nature,” he said. Yet it’s this recent, highly speculative work that Venkatesh feels happiest about. It concerns the Langlands program, a vast web of connections between number theory, geometry and analysis. At the heart of the program is a correspondence — much of it still shrouded in fog — between shapes that arise in two different contexts. On one side of the correspondence are “motives,” shapes related to the solution sets of polynomial equations (similar to the way the circle represents the solutions to the equation x2 + y2 = 1). On the other side are shapes constructed by gluing the edges of a “tile” together; for instance, a torus, or doughnut shape, can be built by gluing the opposite edges of a square tile (though the Langlands program focuses on tiles akin to the curved angels, devils and fish that fill M.C. Escher’s Circle Limit woodcuts). One of the best-understood of these correspondences between motives and tiles formed the core of Andrew Wiles’ 1994 proof of Fermat’s Last Theorem. So far, Venkatesh has only proved a small slice of his overarching conjectures. “But at least now the picture of what should be true is clear,” he said. During the past year at the institute, Venkatesh and Sakellaridis have been investigating two separate questions, one concerning L-functions and the other an extension of Venkatesh’s recent work on the Langlands program. Mysteriously, these two separate strands seem to be converging on the same underlying question. “That’s a very good sign,” Venkatesh said.